Cabela’s NTC Day 1 Standings ! 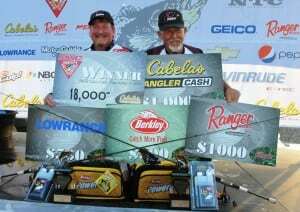 Day 1 of the 2013 Cabela’s NTC sponsored by Cabela’s, Chevrolet, Pepsi, Ranger Boats and Evinrude Outboards is in the books! Day 1 standings are here NTC Day 1 Standings Day 2 weigh in is LIVE on the internet as well as a live leader board.